A brand synonymous with excellent quality, current designs at affordable prices. Hari Raya mood! Woots Woots!Such vibrant colours this time! Nice right? Each of us girls changed a total of 14 times so there are plenty more to ogle at. Wait for the television commercial ya! After every modelling assignment, Nyla would wait and make sure she removes my fake eyelashes! She wants to be 'eyelash remover' when she grows up now. Speaking of modelling stints and whatnots, my cheeky pretty girlies (aged 15-23) better listen up sweetlings! 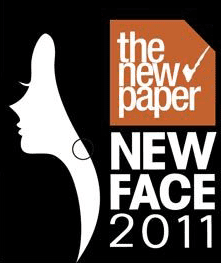 The New Paper New Face Competition is here, hence continuing its quest to discover fresh faces in the modelling and entertainment industry. I personally feel that among all the beauty contests organised, The New Paper New Face wins hands down in terms of the quality of the babes. You read about the recent Miss Singapore World hopefuls? Errrrrr. You know I know la ah. Man, the 2-3 months of being in the 'academy' was a total blast! We girls were fortunate to have attended 'workshops' by the first ever New Face winner, Angelique Nicolette Teo. I remembered her sharing with us hopefuls,"There won't be a question and answer segment during the contest so the personality has to shine through body language." We also learnt runway/ catwalk skills by the absolutely stunning Charmaine Harn and and and how can I forget Mr Daniel Boey, Singapore's top show producer. I have the most utmost respect for him. And girls, if you get into the top 20, rest assured your stomach muscles will tend to overwork thanks to the hilarious Yeoh Wee Teck! Miss Singapore Universe 2007 Jessica Tan was my batchgal. She won 'Best Smile' awarded by M1. If there was a runner up position for Best Smile, I'd probably win that since I was also chosen to model for M1 alongside Jessica. :p Yah I know, not shy hor me. Dunch care! Anyway, that was my first biggest paycheck(4 figure sum) ever for just a few hours of work. PS: You can also nominate your friend/cousin...etc. Click here to find out more. Chin up, be happy and show your best self both inside and out. Be confident, be pleasant, be real. That should garner you good points from the judges. Honestly those were the criteria I set when I was one of the New Face walk in audition judges two years running (2010 and 2011).